suse – Set to Rise!! Polyglot project aims to provide the summary of various choices available for each of the components while developing a web application. It details their strengths so that one can easily choose the right component to build a great solution. I had gone through several blogs, stack-overflow/quora answers to choose a proper database, programming language, web-framework etc. to build a solution in the past. Most of them were out-dated and I had to keep track of the date for each of the posts. So for this HACKFEST 2016, wondered how would it be if we could share the learning through a wiki and collaboratively maintain an up-to-date content. I had a hunch that this might be a problem that many would have faced and would be good to solve. It starts with Questions/Concerns one should keep in mind before starting a project. It goes deep enough, providing a Syntax Cheat Sheet so that one can use it to directly shift the mind from one language to another by going through a single page. It also lists various WebFrameWorks and several Programming Language choices. Am a big fan of Rails and GoLang. The idea is a work in progress.. I was requested during the beginning of this year to give a crash course on C++ for the developers with C background in our company. 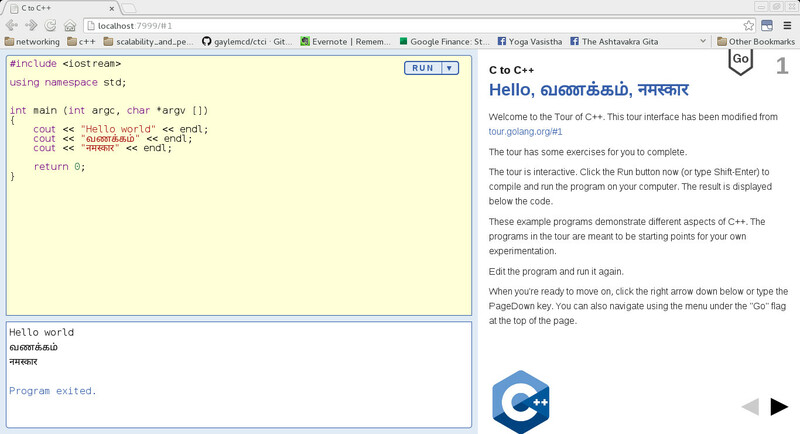 A while back, sankar gave an introduction to go language using http://tour.golang.org/ . Fascinated by the interface of gotour, I wanted to give the C to C++ tour using a similar interface but needed it in a quick time. I discussed it with sankar and he came up with https://github.com/psankar/kuvalai/. He masters in pulling people to learning something new 😉 So I quickly learnt a bit of Go and contributed to kuvalai. It was taking a while to get it done, so we discussed and decided to hack up the go-tour. Made it to work with c++!! Readme.txt – explains howto apply the go tour patches and get it running. It was really challenging to construct simple, connected, practical examples for demonstrating the features. I wanted this tour to go simply like a movie. I did not know that I would enjoy so much doing this stuff 🙂 Got some happy, encouraging feedback from my peers after the training sessions. Perhaps I should thank my manager, Pradeep for persuading me to do this stuff. And my team, some of whom are still pushing me for the final session!! Have conducted four sessions and the last one would cover advanced concepts such as traits, functors, template specialization, c++-11 features etc. The last session is taking time as I dont have practical experience on using traits, but still want to get some practical examples 🙂 Working on it!! The descriptions in the doc. many require some polishing. It has about 42 sections at this point. And as always patches are welcome!!! It is now possible to download GAL contents for offline usage through exchange web services in Evolution. 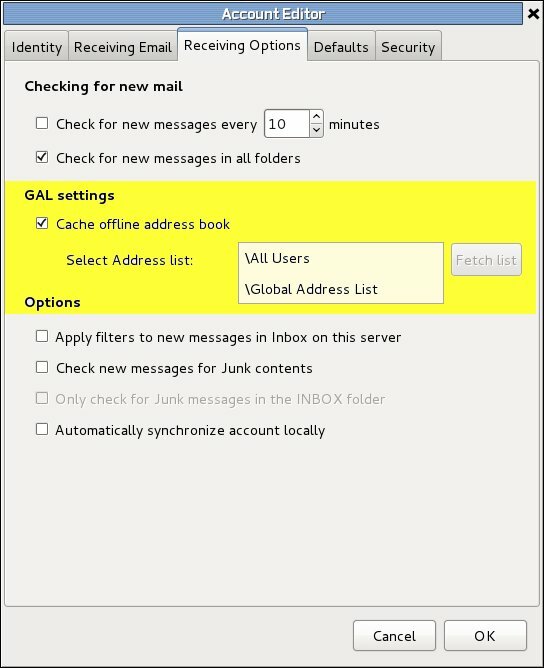 Offline GAL is termed as Offline Address-book (OAB) in Exchange WebServices and it may contain one or more Offline Address-lists (OAL). The check-box, ‘Cache offline address-book’ would be sensitive if the OAB url is discovered using the AutoDiscover service from the previous page (‘Receiving’). On clicking the fetch buton, the available offline address-lists would be displayed in the combo box. The user can select the address-list which he is interested in. If the GAL is not selected for offline usage. 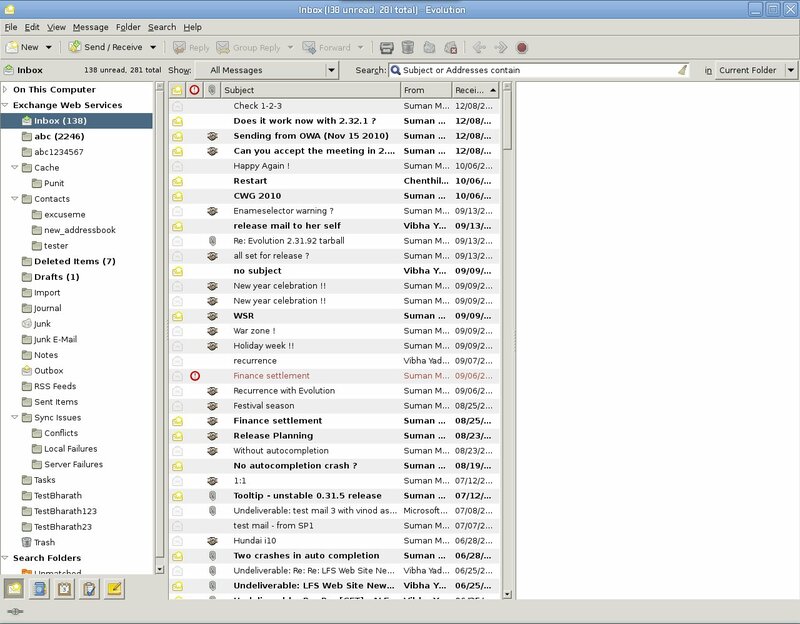 A GAL folder would be created in Contacts component and would be used just for auto-completion when Evolution is online. To change an offline address-list, one just needs to go back to ‘Receiving page’ in preference and select a different address-list. This would remove the old OAL folder and its contents and create a new OAL folder. At the moment, evolution-ews supports caching only one OAL, though it is very easy to extend it to support many. I feel it would sufficient to have one at the moment, but if a need arises, the plugin can be extended to create new OAL folders on demand. If an address-list is chosen for offline usage, one CAN auto-complete while the caching is in progress!! All operations are asynchronous and cancellable. OAL’s would be listed in the link <OABUrl> + ‘oab.xml’. They would be available as compressed files, compressed using LZXD format. There are three versions of OAB ‘2, 3, 4’ and Evolution supports downloading, version 4 OAB Full Details file. To put it simply, lzxd extends the lzx decompression format adding support for differential updates. I have picked up the lzx decompression code from libmspack and modified it to make it decompress the lzxd file. The support for differential update is yet to added. The format for the uncompressed OAB Version 4 file is available at http://msdn.microsoft.com/en-us/library/cc463914%28v=EXCHG.80%29.aspx . Evolution-ews has the decoder which decodes the oab file, converts to EContact and then we populates the address-book sqlitedb in chunks of 1000 contacts. “oab_offline” – says if oab is marked for offline. “hosturl” – contains the host url, used for auto-completion. “oaburl” – contains the oab url. “oalid” – id of the OAL. “gal” – a boolean that it indicates that its gal folder. There has been some issues hindering my work for quite sometime. With the help of teachings/realizations from oneness and ‘http://jkrishnamurti.org/index.php‘ I was able to constantly get over it. But suddenly I was confused again whether the current direction would lead anywhere and remained in it hoping I would get someone to guide. Many a times, there has been a quite a lot of youtube videos and forwarded messages that came to rescue. I started seeking guidance from God with some reasoning rather than ‘yes’ or ‘no’. While I waited for a while lingering on the confusion with no hope that the hindering issues will be solved, suddenly I came across Mahatma Gandhi’s autobiography, ‘My experiments with truth’. ‘Hate the sin and not the sinner’ This which I also realized from JKrishnamurthy’s talk where he says ‘Knowledge in relationship is destructive’. On my introspection into these leads to say, in trying to act intelligently we may think that attaching a character to a person is useful. But overtime am realizing through experiences that a conscious act using the knowledge would cause differences in dealing with people and move one away from humility, truth. More of these characterization in memory leads to unwanted burden of conversation between thoughts in mind, which becomes a real struggle later. I also liked Gandhi’s view on parenting Part III, chapter 6, spirit of service (Page:191). His ways to impart spiritual and litreture teachings for children at Part IV, chapter 32, As Schoolmaster to chapter 34, Training of the spirit (page:311-318, in my edition). I also realized the power of vow from this reading. I have taken a vow this Sunday April 17th and it is working wonderfully well though there were some tests. I will wait for couple of months more before I speak about the vow. I would probably read Bhagvad Gita as well. Off-late we have been working quite aggressively on improving our exchange connectivity using Exchange Web Services . Some evolution hackers sat together during GUADEC 2010 and discussed on the focus areas which our community users as well as corporates would be interested in. Exchange Web Services was on top of the list and David Woodhouse kick-started the work at the same time! The development went on in David’s repo – http://git.infradead.org/evolution-ews.git and you can watch out the progress there.. The festival season has started for evolution exchange and we have evolution showing the folders, mails and meetings using Exchange Web Services. 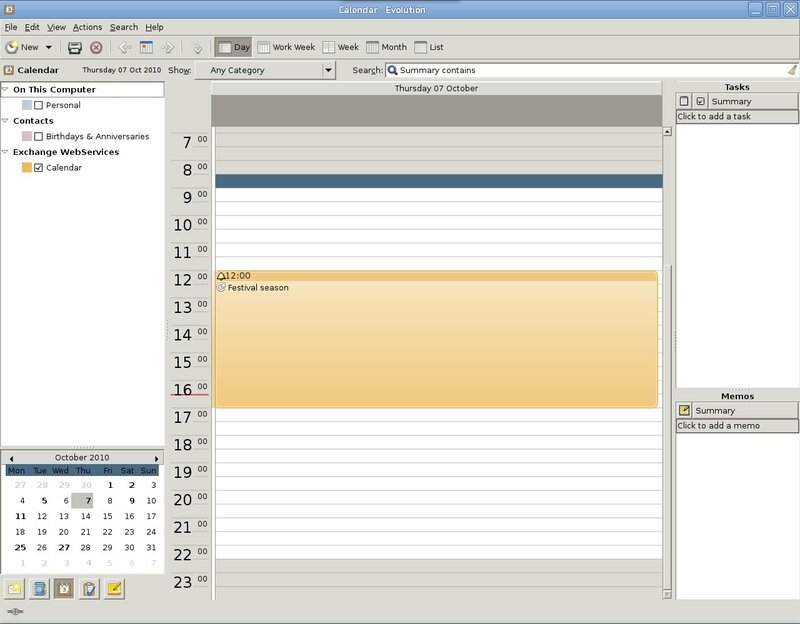 We currently just have the read-only support for mailer and calendar at the moment and we are working towards providing a complete support for calendar, mails and contacts. There are more developers getting involved now and thanks to the organizations for supporting the development!! We are looking forward to deliver the package by the beginning of May 2011 for all the users.. One would be able to use EWS connector with Evolution version 2.32 onwards.. Diligent UI re-architecture to give farewell to bonobo. Improved imap implementation with live view updates, non-blocking operations and IDLE support, IMAPX. DBus transport replacing bonobo for address-book and calendar. GNOME 3.0 cleanup tasks. Gets rid of LibGnome, LibGnomeUi, LibArtLgpl, LibGLade. Evolution-mapi with push mail support and reduced memory footprint. Getting rid of bonobo from evolution was not only a cleanup work, but it enables evolution to shed off lot of weight to get flying. This has provided a lot of positive side-effects, one of the best which needs to be quoted is the startup speed of preference dialog. Evolution is now sleak and fast. If one has used the previous versions of evolution, no one needs to explain for appreciating the work. All credits goes to Matthew Barnes who has done an extra-ordinary job here. We also have the new imap implementation IMAPX, which provides substantial performance improvements over the old imap provider making all the operations non-blocking in nature. Credits to Ross Burton for replacing bonobo with dbus transport in EDS. This would pave way for us to fix some out-standing issues which had been put aside waiting for this change to dbus. There is also some work-in-progress for making this extremely stable in threaded environment. We have listed the probable tasks which would be taken up for the future releases at http://live.gnome.org/Evolution/PlanningFuture. We would be picking up some tasks from there for Evolution 3.0 depending on the effort available. If you have suggestions feel free to get in touch with us to get it added.. Thanks to Akhil Laddha (bug master), Milan Crha (patch master), Johnny Jacob, Bharath Acharya and all others (many to list everyone here.. ) who have made significant contributions for making this release successful. Thanks to all the contributors, translators, distributors and users! !